Vivaldi is a relatively new web browser based on the Blink engine which Google Chrome and Opera use as well. A stable version of the web browser has not been released yet but is expected to become available later this year. Vivaldi is one of the few Blink/Chromium-based browsers that introduced features that Google Chrome does not support. In fact, it is probably the browser with the largest set of custom features when compared to Chrome. The following guide looks at five core features that Vivaldi supports and Google Chrome does not. At least some of them cannot even be added to Chrome with the help of extensions. This is one key-area where Vivaldi excels. You can move the tab bar of the browser from the top to the bottom or one of the sides, and if you don't need tabs, disable it completely. That's however not the only interface modification that Vivaldi supports. It supports options to move the address bar and bookmarks bar to the bottom, and can make tabs transparent if you want. Last but not least, you may display a full menu bar instead of the single Vivaldi menu button. To make those modifications, select Vivaldi > Tools > Settings > Appearance. Vivaldi supports a dedicated search field in the address bar that you can use for searches. While you can run searches using the address bar of the browser as well, you may prefer a dedicated search field instead. While it is currently not possible to select different engines for both search options, it is likely that this will be implemented in a future release. For now, you may find it useful that the search term remains in the search field once you hit enter. Google implemented tab stacking in Chrome back in 2012 but seems to have pulled the feature from the browser again. To stack tabs in Vivaldi, simply drag a tab on top of another. You may do so with as many tabs as you like and will notice that all stacked tabs take up the same amount of space as individual tabs open in the browser. 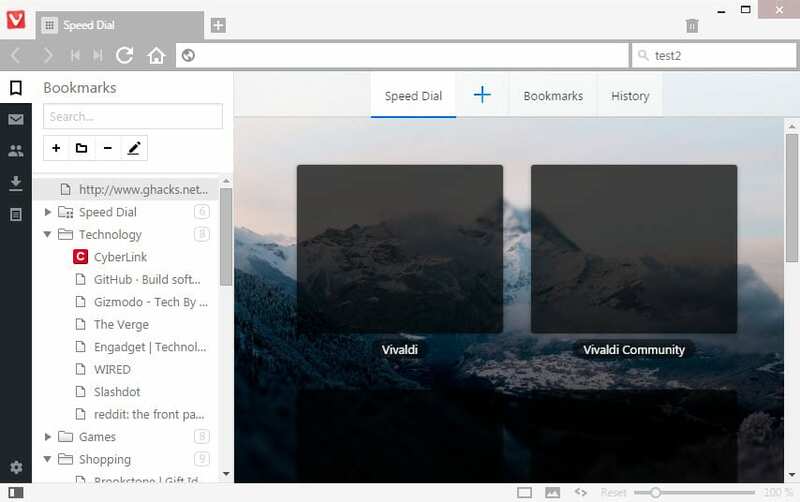 Vivaldi indicates the number of stacked tabs at the top of the tab as bars which you use at the same time to switch between the open web pages. Stacked tabs can be tiled which displays all of them next to each other in the browser window. 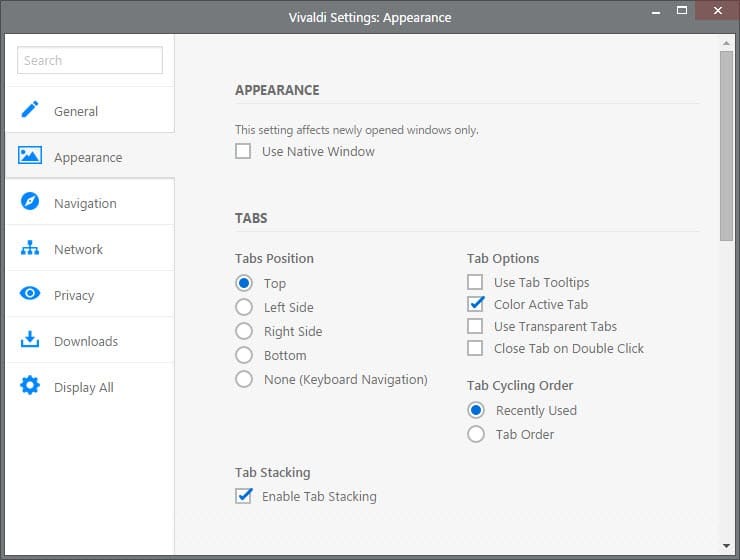 To control tab stacking behavior, visit Vivaldi > Tools > Settings > Appearance > Enable Tab Stacking. 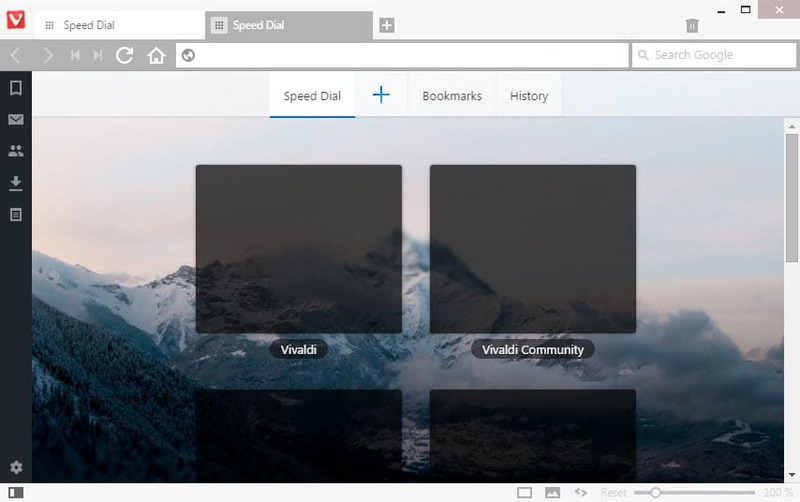 Vivaldi, just like classic Opera, may be configured to display a sidebar panel in the browser. A click on the icons of the panel displays bookmarks, downloads and other sets of data and information that you may find useful but don't need to have access to at all times. So, instead of displaying a bookmarks bar, you may display the panel instead in Vivaldi for that. If you have a widescreen monitor, you may even display one data set all the time for fast access. The panel can be moved to the right side instead, and if you don't want to use it, you may enable the panel toggle to hide most of it on the screen. This is done with a click on Vivaldi > Tools > Settings > Appearance > Panel Position and Panel Options. Panel toggle - this displays and hides the sidebar panel. Page tiling - Only activate when tabs are stacked. It allows you to display all stacked tabs in the same window (vertical, horizontal, grid and untile). Images and plug-ins - Select to load images only from cache or no images at all. Selecting either option will set plug-ins to click-to-play. 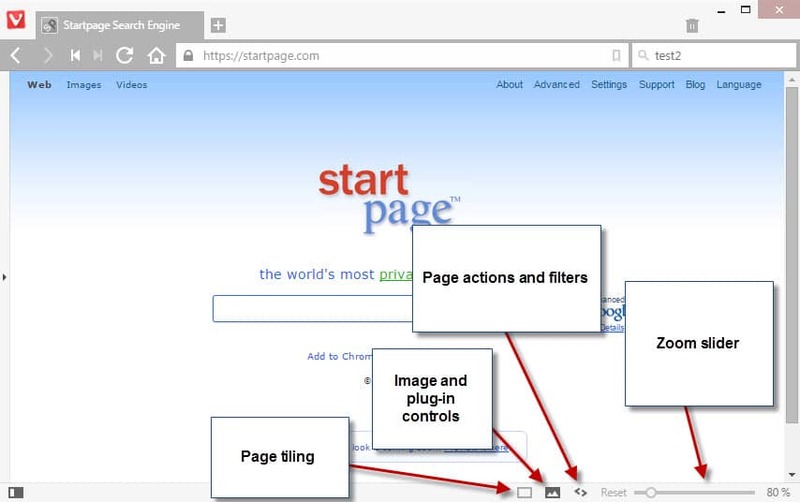 Page actions - A set of filters and a content blocker that you can apply to the web page. You may turn it to black and white only for instance, change fonts to monospace or invert the color scheme. Zoom slider - Change the zoom level of the page using the slider. A reset link is provided as well. Vivaldi has more to offer than that. It lets you change keyboard shortcuts for instance. While those features may not be useful to all users, those who want more control over the browser and its UI may find them more than useful. At the very least, it sets Vivaldi apart from other Chromium/Blink based browsers. Now You: Have you tried Vivaldi? What's your take so far? 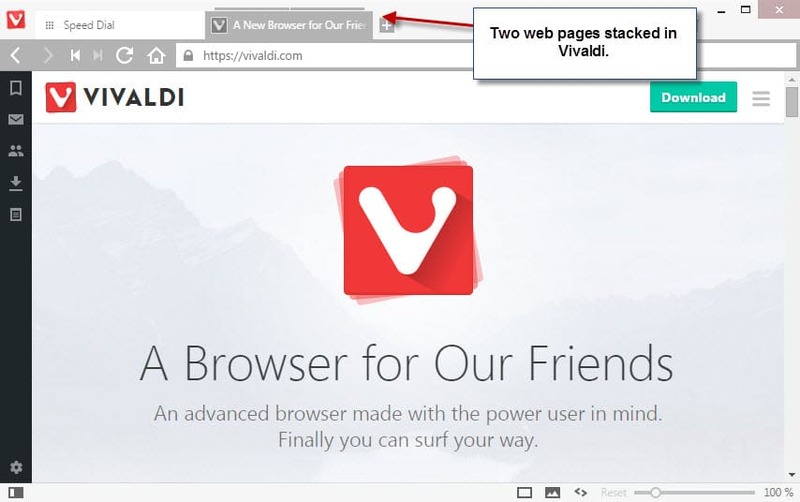 Find out which features the Vivaldi web browser supports that Google's Chrome browser does not support. New Opera can have a bookmarks sidebar too, with https://addons.opera.com/en/extensions/details/bookmarks-by-the-side/ and a small change in flags which enables the sidebar. I’m using Opera about half the time since this became possible. “New Opera” has been sold to a Chinese company so it’s not the Opera it used to be anymore and it will never be. Once the Chinese get their hands on it, it will be like the rest of their browsers – bloated with tons of useless features and false advertised. Likely? If you’ve read this somewhere (vivaldi support forum, roadmap, etc) please cite the reference. As it stands, this just suggests wishful thinking, or supposition, on your part. Likely as in it was the “old” way in Opera and aligns with the “direction” the whole Vivaldi project is moving to. It should take the same extensions Chrome does. Vilvaldi–think I played with it for some “X” number of minutes–end of the testing period. Martin, the article itself shows some great work with organization of information, succinctness, snapshot quality with arrow notations–so well balanced in form and content. So blissfully unaware. Put your task manager on the tray and see it soar every time Vivaldi renders web page. I can’t say that those features are something great. Especially a dedicated search field. What are the advantages over a single omnibox? Bottom toolbar isn’t very informative either. Well, I think that having that choice is better than not having it. If you don’t require the extra search bar, you simply hide it and that is that. In Chrome, you don’t even have that option to begin with. You could use several search engine, say you want to search something on wikipedia, just press down and enter the term. Oh you want to use google next time, press up and enter. People usually don’t realize that it’s helpful unless they try it themselves. Why would I want to limit myself by having to press up or down instead of using the far more versatile keyword function? Because you’re not limited, Vivaldi should be able to do that too. You’re given choice and if that doesn’t fancy you then look somewhere else. But, just because you don’t use it doesn’t mean other people don’t. I’m already using this browser as my standard browser at work and at home. I was searching for a new standard browser for a long time after Presto Opera was discontinued and I never was satisfied. Now, finally I have found a new home, a place I really love. Seriously guys, try it, stick with it and it will empower you to browse the web like – a boss. Im keeping an eye on it. Ive tested it for a while but I find it slow so far. But it does have promise. Needs extensions, after that we might have a real contender on the market. I never really understood why Google optimized the layout of Chrome for “content” and then forgot to move the tabs to the side. Vivaldi is currently my default browser. Works well. What is the new “Protected Content” option in Chrome? Allow identifiers for protected content? No thanx! Does vivaldi has the same? I’ve been watching Vivaldi and it is improving, though it amuses me how much “ooh, new shiny feature” coverage it gets when Opera 12 had such years ago. Granted, it’s the same bunch that made Opera when it was really great and responsive to the user – not just the browser, but the makers thereof. About the only thing holding me back is the lack of fine control to stop animations (.gif, flash, whatever) that makes the web spammy and annoying. I want animation on weather maps, but not on ads. Opera 12 came close, at least. Vivaldi still has a ways to go. When it gets there, I jump ship. Until then… well, man the pumps. I still don’t like that Chrome is the starting point for this browser. I like Presto-based Opera, and the fact that SO MUCH was done in so little code. There seems to be no one that codes effectively anymore – I sometimes wonder if any post-coding work is being done by anyone any more. It seems that everyone believes that throwing a few more cores and GHz at an application is the appropriate solution these days. That said, it is starting to look like *some* of the original magic from Opera is coming back. Too early for me to use it daily, so I’ll be staying with Waterfox for the near future, but with an eye on Vivaldi. The layout reminds me a lot of Maxthon which I recently switched too. I am missing Chrome’s stability however (Maxthon is based on IE) and recently was wishing that someone could combine Maxthon’s Look and feel with Chrome’s features of extensions and stability. Looks like this may be almost exactly what I wanted! Edit: there are long loading times to send msgs here. Very promising. Put a native video grabber/downloader like IDM to attract users. Very fast. Would there be a way to hack Chrome or Chromium to do the tab stacking at all? I doubt that this is possible unless Google implements it first. Extensions do not have enough rights to modify the browser’s UI. Needs to improve GUI with some themes that are more better for eyes not only red black white !!! Some menu bar like in 7 Star Browser, better cookie and java script control as in Chrome based browsers etc… still much room for improvements, but is nice how browser is developing ! I use it also ! One more cool feature in Vivaldi, is that a search in url box shows related bookmarks and history at same time. @Steve, latest version has implemented more tweaks for theming. Another chrome clone in my opinion.